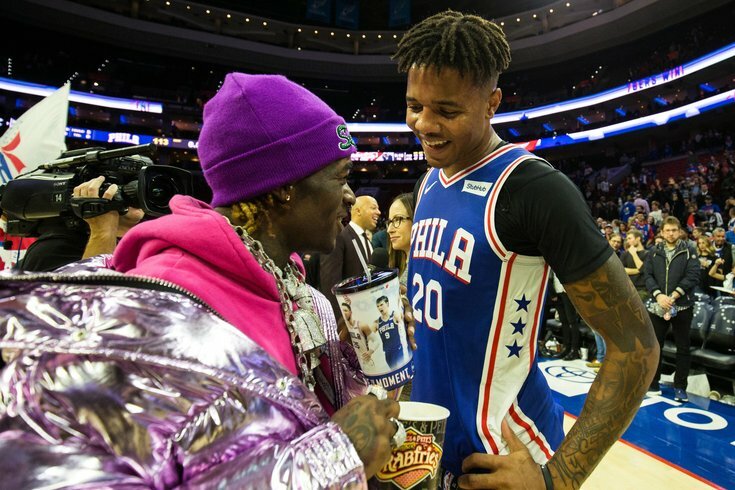 Philadelphia 76ers guard Markelle Fultz talks with recording artist Lil Uzi Vert after a victory against the Atlanta Hawks at Wells Fargo Center. It was not a pretty scene at the Wells Fargo Center when the clock struck zero for halftime. A lackluster performance against a dreadful Hawks team had the Sixers locked up at 47-47 on Monday night, and there was a smattering of boos from the home crowd to let the players know what they thought of the effort. Mailbag: Should Dario be a fixture in Sixers' long-term plan? The game sure took a turn after that. Behind a dominant start to the half from the team's starting group and one of the best stretches of Markelle Fultz's career to date, the Sixers ran Atlanta out of the gym in the final two quarters for a convincing 112-93 win. Philadelphia hardly needed their best to close the deal, and that in itself is a good sign during a lackluster start to the year. But how they got there deserves closer examination. Matched up against former assistant coach Lloyd Pierce, the Sixers' starting group faced a defensive scheme that has become increasingly common as the season rolls on. How they attack this problem will define this season and perhaps their future, and the team's flow out of different looks certainly defined what was otherwise a fairly meaningless game against the Hawks. The Sixers had to know Pierce's Hawks would come in prepared to exploit their lack of shooting in the starting lineup. They may not have been prepared for just how extreme the defense tilted away from Philadelphia's guards. Primarily using the defender assigned to Markelle Fultz — it was Kent Bazemore more often than note — the Hawks sent hard doubles in the paint anytime the Sixers tried to establish someone on the low block. It was most effective and choking the life out of Joel Embiid's scoring, as the center managed just 10 points on 3/9 shooting. We don't need to belabor the point with a million clips, but here's an easy example from Monday. That's very obviously not good for the Sixers. And it is now starting to become a bit of a trend for the Sixers to face this style of defense against their starters, undercutting the fast starts they got off to for most of last season. "It's a challenge, it's a challenge early because it comes back to some spatial issues that effect Joel," said Brown of playing the pair together. "What I'm trying to do is have it all, you can play them a little bit together and then separate him and give one the ball, then the other person the ball, I've said quite candidly Markelle is a point guard. Ben is the rookie of the year, as a point guard. We mix and match a little bit but it is a challenge." Ask either of Fultz or Simmons whether they're concerned by the struggles the duo have had together, and they shrug them off as a product of needing more reps together. Both compliment the other routinely. But the eye test and the numbers have been catastrophic so far in both directions. The Sixers are better collectively when either guard is without the other, despite the collective talent between them. Some of the differences in those particular stats are misleading because of course the Sixers will shoot better from three when there's only one non-shooter on the floor at a time. But it's reflective of the leaguewide reality in 2018, with theoretical floor-spacing proving more valuable to lead ballhandlers than anything else, even if their shooters don't have good nights. The discrepancies are fairly large in some respects, and you don't need a basketball doctorate to figure out why. With the way teams defend them on the perimeter, both guys have a difficult time getting to their spots with the other on the floor. For my money, the most jarring nightly example of this phenomenon in effect has been the moments immediately after Fultz comes out of the game in the first quarter. Each time he exits and Simmons remains in the game, there is an immediate emphasis to get Simmons going toward the rim. And once again on Monday, Simmons turned the first post-substitution possession into a dunk. And that only underscores a question that is unlikely to die just yet. Is the best way to develop Fultz (and the team) to start him with Simmons? Whether or not Fultz deserves to be a starter doesn't really interest me. Whether the current arrangement is the best way to help him reach his upside is a much more interesting debate. I don't care one bit how much he missed by on attempt No. 2. If there's an example clearer than that to show what a difference it makes for him to feel jolts of confidence, I haven't seen it. And in that respect, I think there is a case to be made that the best thing for Fultz, short and long-term, would be to make him more of a primary weapon on the bench, cutting back on the overlap with Simmons in order to turn him loose on his own. Basketball is a rhythm sport, and positionless as the game has become there is still a need to hand guys responsibilities they're comfortable with. I don't care if you call someone a shooting guard or a small forward, but I do care whether you can find a comfort zone playing on or off the ball. When Fultz is able to feel out the game and can exploit increased spacing around him, he looks a heck of a lot more like a No. 1 overall pick than he has otherwise. He's able to settle in and dictate the tempo on the break and in the halfcourt, and you see that in how he attacks the paint, too. Using the attention Redick drew turning the corner, Fultz went downhill without playing out of control, and used some dribble craft combined with body movement to create enough space to finish past Dewayne Dedmon. Even if the Sixers don't want to scrap Fultz as a starter completely, there are still some wrinkles to test out. Dario Saric has had a horrific start to the season, and Brown admitted after Monday's win that he looks like he has dead legs out there. Why not kill two birds with one stone and give Saric a night off, bumping Redick into a smaller starting five? Accounting for Redick's shooting is a much different proposition for opposing defenses, and it's a leaner, meaner group on the whole. Brown probably won't give Saric a rest until they get Wilson Chandler back in the rotation. Still, empowering Fultz doesn't mean you need to force feed the Simmons/Fultz pairing before they're really ready to run together. Growing his comfort and confidence at the NBA level should be priority No. 1 — it is the foundation of all that he may become. Fultz put the final nail in the coffin on Monday, but it was last year's starting five that buried Atlanta out of the break. They played some good, old-fashioned bully ball out of halftime, using high-low action between Embiid and Simmons to break Atlanta's back. The Simmons-Embiid partnership had it going on in the third quarter, and it was a well the Sixers went back to all throughout the period. Simmons got to the line a bunch (and converted all five of his attempts there, a rarity) and converted some good finds from his large friend. After the game, Simmons complimented Embiid for the improvement they've seen in his passing over time, and though it was a quiet night for the big man as a scorer, Brown made sure to insist to reporters that it was in no way a bad night for Embiid. "I thought that what he did do is he welcomed passing," said Brown. "If you can get him the ball and get him it like two, three, four times in a row, let him feel comfortable reading the gym and passing out of the gym where it's not as infrequent a read...I thought he did a hell of a job passing. I thought he was unselfish. I look forward to seeing that third period but I thought he was really good tonight." When the high-low game wasn't on, it was Simmons ripping Atlanta to shreds, and when he checked out an assist shy of a triple-double (21 points, 12 rebounds, nine assists) in the fourth quarter, there was no doubt who had flipped the game on its head to start the second half. With enough shooting around them to keep defenses honest, Simmons and Embiid are a devastating combination. If Fultz can become reliable and prolific enough on that front, regardless of what it takes to get him there, this team will beat up on much better teams than the Hawks.